Jose's Art Journal: Tony Pro's Demo Part 2. Methodology. Tony Pro's Demo Part 2. Methodology. 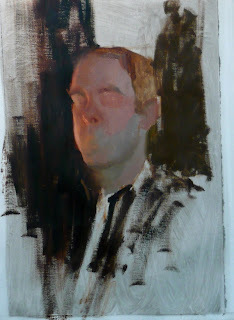 Tony Pro's style is lush, rich and rooted in classical tradition and many influences (as it should be). He is a master of "alla prima" and his demo was in that style. 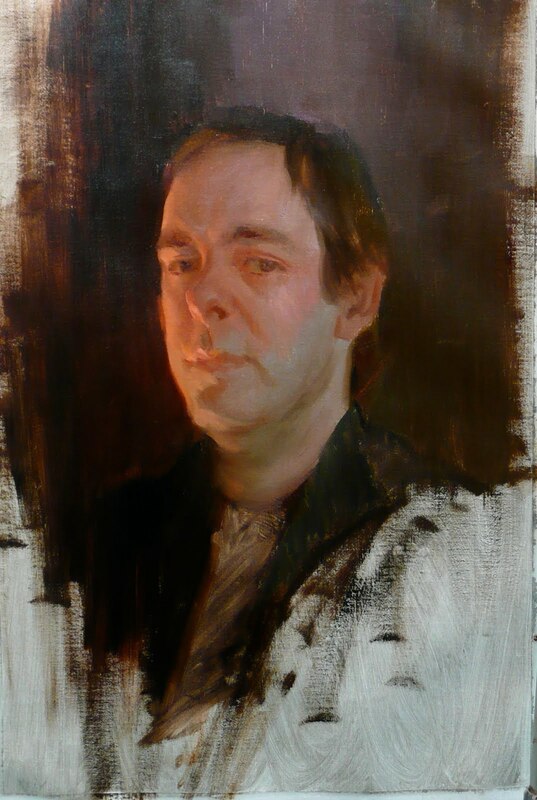 The basis of his method during the workshop was to start with the average of the main blocks of color and work towards the lights and darks. His canvas was primed in a neutral grey. A preliminary drawing is necessary. Through comparative measurement and shape relatedness, the basic angles and key lines are rendered, a map of the main features. 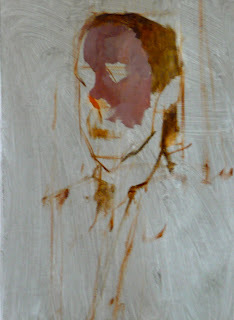 The likeness of a model, says Tony, really hinges 85% on the triangle formed by the eyes and the nose tip. How far, big or wide the eyes are with respect to the nose. The way this triangle rests on the remaining head structure determines 15% of the recognition of a character. Of course this is just theoretical but hints at where likeness can derail easily. Once the preliminary drawing is enough to map the features of the model, we proceed to block the main areas of color with a careful assessment of the light temperature and how its relative tone and chroma might affect the final result. 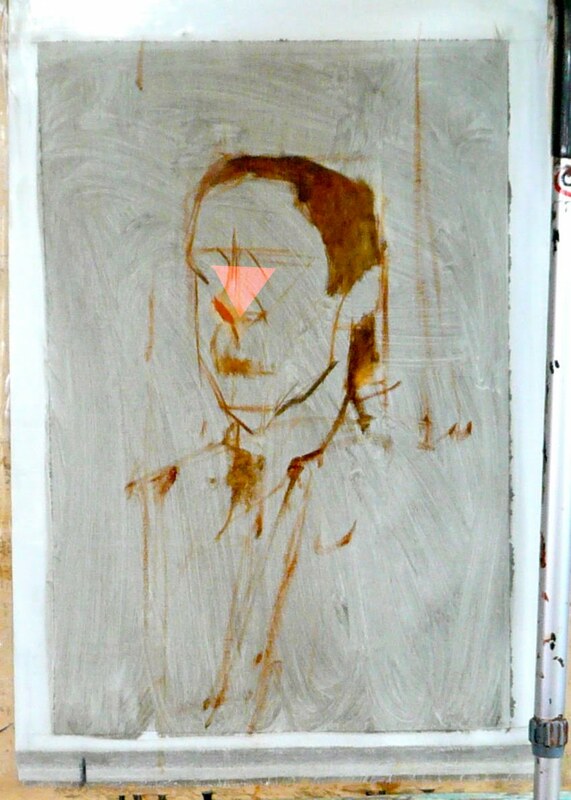 Squinting provides the necessary abstraction of shape and color to start blocking in the shapes. 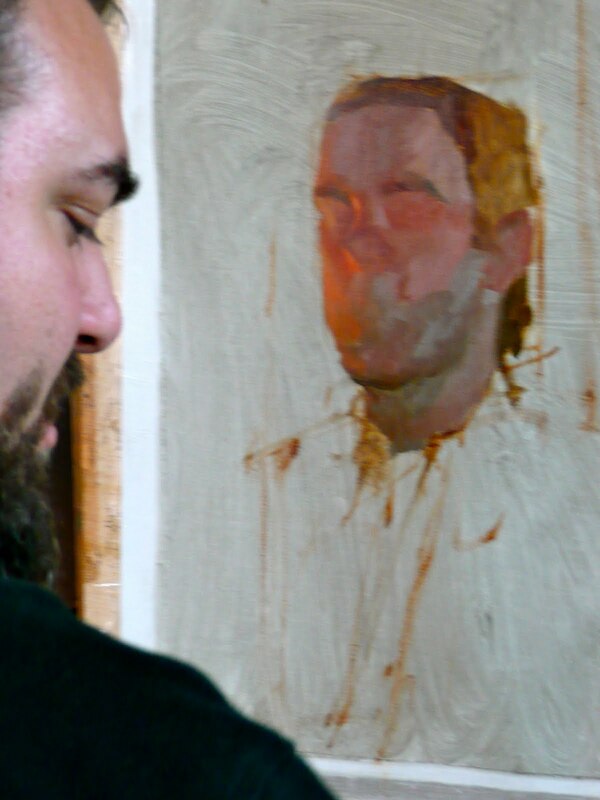 The main planes of the head are covered paying special attention at the tone and color. 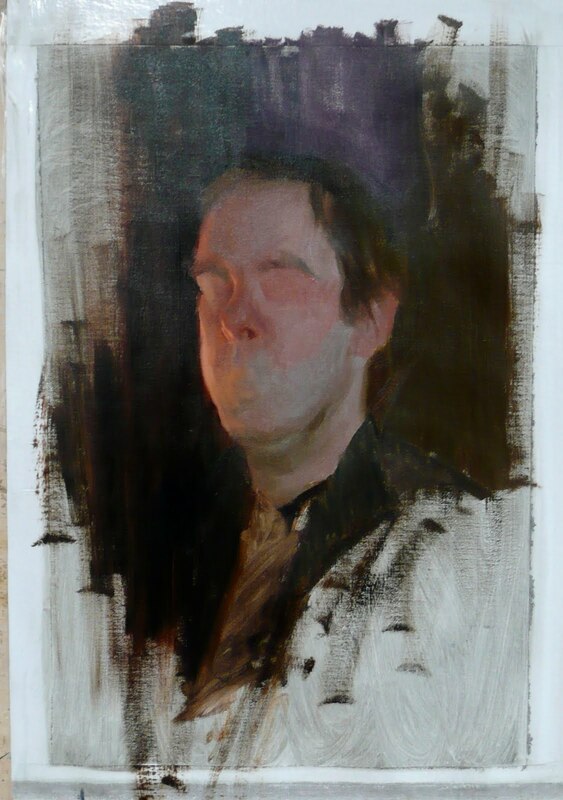 No hurrying here, no fireworks, the foundation of the whole portrait needs to be solid. As reference, Tony pointed to Assaro's head to get some clues as to where the primary planes fall. Observe how he just blocked in the eyes as reddish shadows, and the cylinder containing the muzzle as a basic shape, no lips or eyelashes . We will "sneak in" into these details at a later stage, when we are sure the main and secondary planes are properly featured. 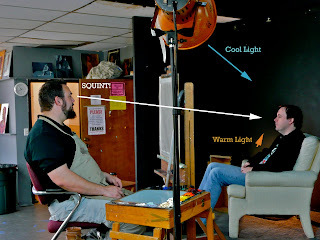 The main areas of color, including the background needs to be placed to get an accurate idea of the relative value of all colors. For example, the model's pale skin looked dark until it was compared to the deeper blacks of the background. Ditto for the color temperature on both sides of the face. Most areas will remain simple, most of the modeling and work will occur where the warm light meets the edge of the cool area. No mysteries here, no magic brush, the modeling and chiseling of the face proceeds in the same manner, always looking for the simplest shapes. No hesitation to wipe them out and revert to simplicity when things get out of hand. It is easy to get "muddy" in a hurry by overworking details and adding information that adds nothing. That is why it helps to have the main areas "solved" before moving on. You get the idea. Down here I post the final or almost done result. Tony Pro's workshop Part 1. Set up. Show at the Los Angeles Cathedral.